Roku revealed Tuesday that the RCA brand has joined the stable of TV vendors that will offer integrated Roku TVs this year. The RCA trademark is currently licensed for TV marketing in most of North America by Technicolor to Display-Vu Corp. an affiliate of Curtis International. Roku said RCA brand TVs will leverage the Roku TV platform to build and deliver smart TVs that run the Roku OS in the U.S. and Canada. 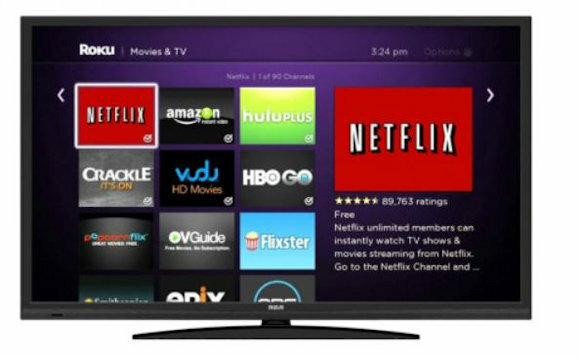 Delivery of the first RCA Roku TVs is expected “in the coming months,” Roku revealed. RCA branded TVs, under various licensees, long have been staples of discount giant Walmart in addition to Sears and other high-volume discount store chains. At one point in its history–under Thomson SA, which later became Technicolor–the TV brand was a perennial color television market share leader in the United States. It was also among the first brands at the launch of the television industry. Under licensee On Corp., the RCA TV brand was used to market lines of “Roku-Ready RCA TVs,” like the model pictured at top. Those models bundled RCA HDTVs with a Roku streaming stick to add the Roku streaming experience. The fully integrated sets, speed up the process of using the TV and finding and selecting streaming services and favorite programs, and integrate easy to find sources for cable and satellite TV boxes, Blu-ray players and other devices. Since Technicolor decided to exit the television marketing business, it has licensed the RCA trademark to a succession of licensees looking to quickly capitalize on a highly recognizable brand that brings acceptance from buyers at some of the country’s largest department stores. Over the past decade the brand has been licensed for traditional TVs by China’s TCL, and South Korea’s On Corp. Curtis International had also licensed the trademark earlier for Canada as well as for very small-screen mobile and portable televisions in the U.S. Since its introduction in TCL and Hisense TVs four years ago, the Roku smart TV platform has become one of the most popular smart TV systems on the market. Roku revealed at the end of 2016 that Roku TVs accounted for nearly 13 percent of smart TV sales in North America. Roku TVs are now marketed by TCL, Hisense, Insignia, Hitachi and Element. It previously had appeared in a short-lived line of Sharp branded models. The simple and intuitive layout of the smart TV OS has proven highly desirable to mainstream TV audiences looking for Ultra HD and HDTVs that are easy to use and relatively inexpensive. They also offer a consistent use and quality experience across brands. More importantly, Roku offers one of the largest lineups and channel stores of available streaming partners (more than 300) in the industry, including all of the top streaming audio and video services like: Netflix, Amazon, Hulu, Vudu, Google Play Movies, YouTube, CBS All Access, Sling TV, DirecTV NOW and others. Display-Vu did not disclose details on how many models or lines of Roku TVs it will introduce this year or whether or not any of them will offer 4K Ultra HD or new 4K Ultra HD with HDR capability, like competitive models planned by TCL and Hisense this year. We’ve asked for details. Stay tuned. Other key features in Roku TVs include a small, easy to use remote control, Roku mobile app for iOS or Android smartphones that controls the Roku menus and adds voice search, private listening, access to a keyboard, the ability to share photos or music to the TV and other functions.